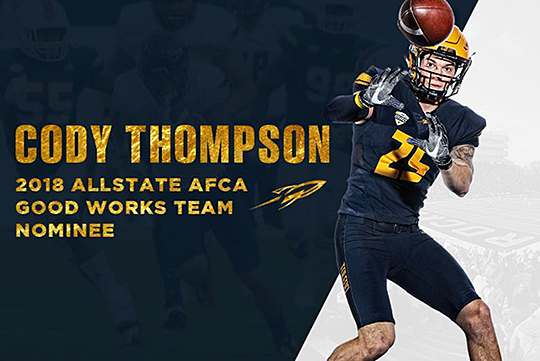 Toledo senior wide receiver Cody Thompson has been nominated for the 2018 Allstate American Football Coaches Association (AFCA) Good Works Team. It is the second consecutive season that Thompson has been nominated for the award. Every year, the Allstate Insurance Co. and the American Football Coaches Association honor college football players who balance academics and athletics, while remaining committed to helping others and bettering their communities. Thompson was a first-team All-Mid-American Conference selection in 2016, catching 64 passes for a then school record 1,269 yards and 11 touchdowns. Last season, he was averaging 126.3 yards per game and 18.7 yards per catch going into the Eastern Michigan game Oct. 7 in which he suffered a season-ending injury. He was granted an injury hardship waiver by the NCAA, giving him another chance to complete his senior season. Thompson, who earned Academic All-MAC honors in 2016, graduated last December with a 3.7 GPA in marketing. He is pursuing his master’s degree in recreation and leisure. He has volunteered for numerous community activities and organizations, including the Toledo Boys and Girls Club, Ronald McDonald House, Cherry Street Mission, RockeThon for Mercy Children’s Hospital, Kids Day at the Glass City Marathon, Victory Day, the Toledo Crash wheelchair football team, and more. A total of 169 student-athletes from all levels of college football were nominated for the award. A final roster of 22 award recipients will be unveiled in September. From the nominees submitted by sports information directors across the nation on behalf of their schools, a special voting panel consisting of former Allstate AFCA Good Works Team members and prominent college football media members will select the 2018 Good Works Team. Once the final team members are announced in September, fans are encouraged to visit the Allstate AFCA Good Works Team website on ESPN.com, featuring profiles and images of the players, for the opportunity to vote for the 2018 Allstate AFCA Good Works Team Captain. The Beta Gamma Sigma Chapter in the UT College of Business and Innovation has qualified for recognition as a Highest Honors Chapter, the top level of recognition a chapter can earn as part of the Chapter Honor Roll Program. Qualifying for Highest Honors is indicative of a campus where academic excellence is highly valued and where the faculty officers of the chapter work diligently to enhance Beta Gamma Sigma’s stature on campus. UT Beta Gamma Sigma Chapter advisors Kimberly Nigem, left, and Dr. Amal Said, right, posed for a photo with chapter officers, from left, Eric Wright, Amanda Martin, Gabe Gretz and Breanna Straka. Kirsten M. Zalewski, another chapter officer, is not pictured. The chapter advisers are Dr. Amal Said, associate professor of accounting, and Kimberly Nigem, associate lecturer in management. Founded in 1913, Beta Gamma Sigma is the international business honor society for Association to Advance Collegiate Schools of Business-accredited institutions, which are the top 5 percent of business school programs around the world. Inducted as students, Beta Gamma Sigma members go on to serve in critical leadership roles in corporate, entrepreneurial, government, nonprofit and academic sectors. “This recognition is their recognition,” Nigem said. “They dedicated many hours to Beta Gamma Sigma and passionately pursued their vision of what UT’s chapter should, could and did accomplish. Through the efforts of their highly motivated, innovative and creative team, the chapter has earned this award. The award is truly a reflection of who our students are: They are Beta Gamma Sigma, they are the College of Business and Innovation, and they are UT. Dr. Anne Balazs, dean of the College of Business and Innovation, will accept the award during the Association to Advance Collegiate Schools of Business International Conference and Annual Meeting in April. Nigem said, “This award is a reflection of UT’s and the College of Business and Innovation’s dedication to excellence inside and outside of the classroom. I am very proud of our student leaders and their commitments to academic, professional and personal success. They are tremendous ambassadors of our UT Rocket nation. Beta Gamma Sigma members reside in all 50 U.S. states and more than 190 countries. Notable members include Nobel Prize winners, Olympians, inventors, CEOs of major global companies and nonprofit organizations, deans of the top business schools, and others who are making the world a better place at all levels of contribution through social enterprise, service and leadership. A Highest Honors Chapter is eligible for several benefits, including one Global Leadership Summit Registration Scholarship, which covers the cost of one student registration, hotel accommodations, program materials, and most meals for the 2018 Global Leadership Summit to take place in November in Chicago. Do you like to sing jazz? Are looking for a unique ensemble to join this semester? If so, audition for The University of Toledo’s Vocalstra. Vocalstra is a vocal jazz ensemble founded by legendary singer Jon Hendricks. The group provides singers with the opportunity to learn and perform jazz standards, blues, vocalese (a genre of jazz singing in which words are set to instrumental recordings), and other contemporary genres. Dr. Ellie Martin directs Vocalstra during a rehearsal last fall. 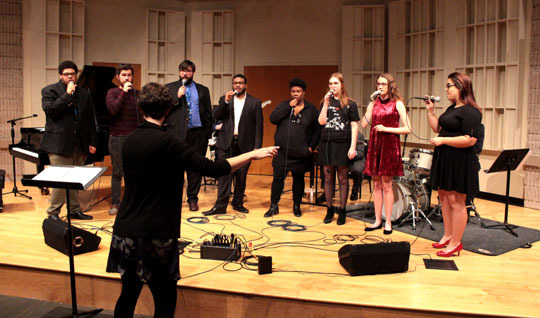 The ensemble is composed of a variety of people ranging from first-year undergraduate students to seasoned professionals from the local music community. The ensemble is looking for new, passionate and committed members whether they’re experienced jazz singers or just starting out. This class will help singers develop skills in microphone technique and improvisation. Auditions will be held in 10-minute increments in the Center for Performing Arts Wednesday, Sept. 5, from 4 to 7 p.m.
Singers auditioning are expected to prepare a song of their choice, preferably in the jazz style if possible. To sign up for auditions, click here. For questions regarding auditions, contact Dr. Ellie Martin, instructor in the UT Music Department and director of Vocalstra, at lee.martin@utoledo.edu. The Office of the Provost has launched a new online University catalog. 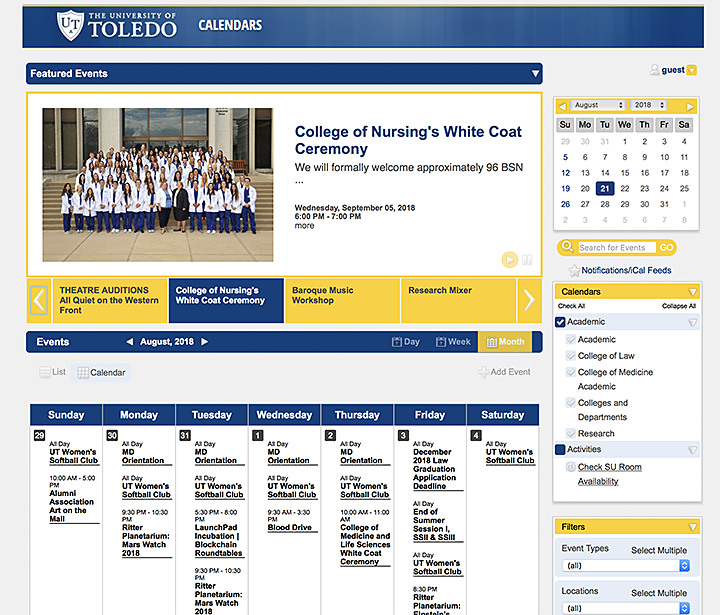 The new catalog is built on a computer-assisted translation software platform, which integrates with student information systems, flags errors, and provides summary reports to deliver an academic catalog website that accurately reflects the University’s programs. “The computer-assisted translation program ensures that the material in the catalog is aligned with the contents of Banner and UAchieve, thus bringing us one step closer to an integrated software environment that supports our students’ success in navigating and completing their academic programs,” Dr. R. William Ayres, senior vice provost for academic affairs, said. Catalog content is search engine-optimized and features advanced search capabilities so important content may be found quickly. The catalog also may be integrated with social media so students and advisors are able to share information. And while the catalog still will be published once a year, users have the ability to produce formatted and print-ready PDF documents from any page with a single click. Now the Office of the Provost is developing a curriculum tracking system that integrates with the new catalog. The curriculum management software works with the catalog’s computer-assisted translation program to automatically update the catalog with approved course, program and student information system data. “The curriculum management software shares information from Banner to deliver a seamless progression from curriculum proposal through faculty governance to publication in the catalog,” Ayres said. Faculty and staff training sessions on the new curriculum management system will be announced during fall semester. For more information on the University catalog, contact catalog@utoledo.edu. The University of Toledo is launching Downtown Connect, a late-night bus service through TARTA for students, faculty and staff traveling downtown on Thursday, Friday, and Saturday evenings. The route will leave from Gateway Plaza beginning at 11 p.m. on Thursday and Friday, and 8 p.m. on Saturdays, with the final pickup from downtown at 2:35 a.m. The bus will arrive at Gateway Plaza on the hour for pickup. The late-night route will include stops in the Warehouse District, Promenade Park and the Uptown District. Return stops will be at apartment complexes near campus, with the final stop at Gateway Plaza. This service provides students the opportunity to explore and enjoy restaurants, concerts, games and special events going on in downtown Toledo. View the routes here, and learn more about Downtown Connect here. The University of Toledo’s first football game of the season is Saturday, Sept. 1, when the Rockets take on the Virginia Military Institute’s Keydets. Students are reminded that they may attend games free by presenting their Rocket ID card. • Overnight parking is not permitted prior to all home football games, even if a pass is displayed. • On Friday, Aug. 31, lots 6, 9 and 10 will close at 9 p.m. All vehicles in these areas must be moved elsewhere before 2 a.m.
• Beginning at 3 a.m. on Saturday, Sept. 1, any vehicles remaining in these areas will be towed at the owner’s expense. • Lots 3, 4, 5, 6, 9 and 10 will open at 6 a.m. on game days. Fans intending to park in these areas will need to have the appropriate parking pass available to allow entry. • On all game days, lots 18 and 28 will close at 1 p.m. for public parking, and will open for game-day parking with the appropriate game-day parking pass. • General admission parking areas — 1, 2, 12, 13, 19, 20, 25 and 26, as well as the east and west parking ramps — are open six hours prior to game time; overnight parking is not permitted. • UT students, faculty and staff may park for free in any of the general admission parking areas on game day. For Saturday, Sept. 1, general admission parking will open at 1 p.m. To make entering campus and parking more convenient for fans, the University will no longer collect parking fees or general admission passes at the entrance of these parking lots. All parking is based on availability; if a parking area is full, fans will be directed to the next available parking lot. 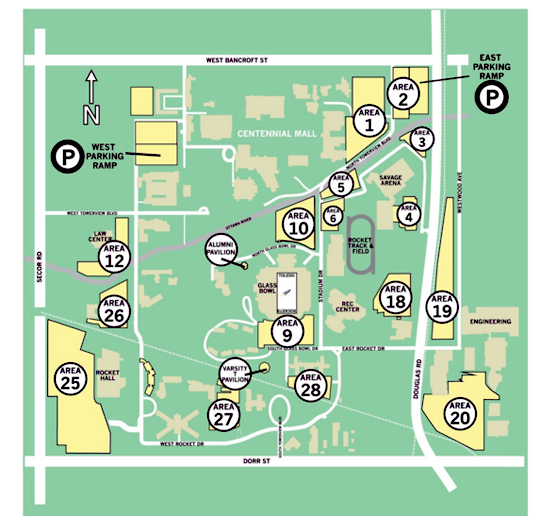 More information about football parking, including a map of parking areas, is available here. As another academic year ramps up, there are events galore on the horizon. To make sure major happenings don’t overlap, campus community members planning events are reminded to check the University’s master calendar at calendar.utoledo.edu. Faculty, staff and students also are asked to post events to the online calendar. Sharing information about events is easy: Go to calendar.utoledo.edu, click “add event,” and follow the prompts. 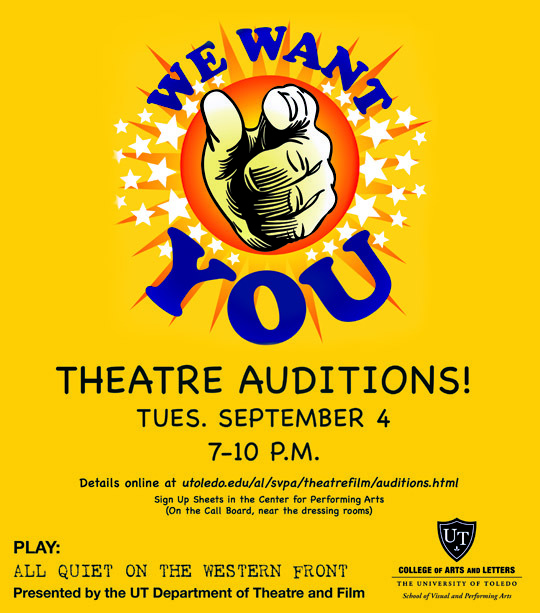 On Tuesday, Sept. 4, The University of Toledo Theatre and Film Department will open auditions for its production of “All Quiet on the Western Front” from 7 to 10 p.m. in the Center for Performing Arts. “All Quiet on the Western Front” was originally a novel written by German World War 1 veteran Erich Maria Remarque. It tells the story of the physical and mental hardships soldiers endured during the war and the fallout in their lives upon returning home. Auditions are open to all. Even though the story focuses on men, the department practices an open-casting policy to reflect the diversity of the community. Sign-up sheets are posted on the Production Call Board near the dressing rooms in the Center for Performing Arts. Additional information on the auditions can be found here. Those interested in another play this season will need to sign up for that audition separately, as there are individual tryouts for each play. Audition forms can be filled out in advance and picked up from the folder on the Production Call Board. Forms must be brought to one’s audition. Additional audition forms will be available at the table the evening of tryouts. Callbacks for the November production will take place Wednesday, Sept. 5. Information for other shows can be found at the Theatre and Film Department’s website. To provide a safer, cleaner and more accessible environment, Centennial Mall is closed to vehicle traffic without a special limited-access permit. The University of Toledo Police Department, emergency vehicles and paratransit, as well as essential service vehicles, will continue to have access to Centennial Mall. To assist with necessary deliveries to various buildings that require access from the mall area, the University will provide service vehicle parking spaces adjacent to the mall and 30-minute parking in front of each gate area for marked University, vendor and contractor vehicles, as well as employee service vehicles that display a loading zone permit. All University vehicles used or operated by faculty, staff or students must be parked in approved spaces; parking restrictions and prohibitions will apply in all instances, and assigned drivers will be responsible for any tickets issued through their department, as described in the parking policy. University maintenance and service vehicles may park in appropriate service areas. Personal vehicles that are used for University work purposes must be parked in approved spaces and follow all parking and traffic regulations. Please refer to the vehicle traffic and parking procedure for additional information. All 12-month faculty and staff are reminded to complete their assigned compliance course work by Friday, Aug. 31, if they haven’t done so already. You may access your assigned course work online by logging in to myUT, clicking on the Employee (or Affiliate) tab at the top of the screen, and scrolling down to the Training and Career Development section. Or you may click on the link in the reminder emails from the address “University of Toledo [mail to: donotreply@lawroom.com].” Please read the instructions before starting. If you have questions about this compliance training or need assistance, contact Keenen Fisher in Human Resources at 419.530.1435 or keenen.fisher@utoledo.edu, or Dave Cutri, executive director for internal audit and chief compliance officer, at 419.530.8718 or david.cutri@utoledo.edu. Nine-month and part-time employees should complete their compliance course work by Wednesday, Oct. 31.